The commissioning event that included the color parade and graduation ceremony and hearing president Obama addressed the graduates at the Naval Academy, and perhaps the visit to the Museum of Civil War in Baltimore stirred patriotism in me and encouraged me to explore historical places in the country I call home. I decided to take advantage of the rental, fuel-efficient GLK350 and its GPS to discover the Beltway. I drove West onto US50 to Washington, DC. Driving through a freeway walled by trees and greenery and not by stucco or concrete, I felt as if I was traveling through the countryside. It made driving pleasant. The drive from Annapolis to DC took less than 40 minutes, but as we arrived in the city, the enclosed surrounds of streets, the noise of cars and motorbikes, and the traffic were a harsh reminder why I would prefer to leave the driving to someone else on road trips. It took us more than 30 minutes just driving around the city and looking for parking. Since some of the family members had to go back to Annapolis, I did not check-in to my hotel until after our visits to the most famous DC landmarks. We visited the White House (saw front and back from outside), the World War II Memorial, the Vietnam Memorial and Korean Memorial and we walked up to the Lincoln Memorial where we lingered around to enjoy a Memorial Day holiday concert. A young family member commented about seeing a character in the movie "Forrest Gump" wading at the Reflecting Pool and not about the historical significance of the place, like where Martin Luther King, Jr. delivered his famous “I Have a Dream” speech. It was then I realized why it was important to bring our kids to visit such an important place. We spent the Memorial Day holiday soaking in history by visiting the Smithsonian Museum of American History, and the Museum of Natural History. The museum tour guide mentioned that the Smithsonian has millions of items, but only display 10% of the artifacts at a time. Later, we watched the Memorial Day Parade just outside the Smithsonian Museum. We went to the National Archives to see the Declaration of Independence and Constitution. The following day, we hopped back into the car and drove to Arlington National Cemetery. I missed the exit to the Arlington Cemetery so I drove back and always missed the exit at the roundabouts. I do not know if it was me, but the GPS seemed to be messed up by the roundabouts. However, we were in no rush, so I took the driving around and around the roundabouts (pun intended) in stride. It was nice to cross bridges and see the breathtaking views of the Potomac River down below. Crossing another bridge, a simple sign pointed straight up into the easy green hills and the Arlington National Cemetery. We took the tram tour within the cemetery. It felt weird touring a cemetery and seeing acres and acres of white crosses, but it seemed to fit in the context of Memorial Holiday. One of the highlights of the tour was a walk to President Kennedy’s grave and the eternal flame. It was up on the hill and had a direct view of Washington DC – Memorial Bridge, Washington Monument and Lincoln Memorial. After the visit to the Eternal Flame, our tour guide reminded us that we were on hallowed grounds and to turn our cell phones off. Our next stop would be at the ‘Changing of the Guard’ at the Tomb of the Unknowns. He said, “Prepare to be impressed. It’s one of the most memorable events you’ll ever witness in your life.” The ritual was impressive, yes. However, I could not help to compare the ritual to the changing of the guards I saw in London and in Prague, their rituals more like a show with their colorful uniforms. Our last stop in Arlington National Cemetery was at the house of Robert F. Lee. Now called the Arlington House, a Greek revival mansion that was set like an overseer at the top of the hill, over-looking the Potomac River and the National Mall. Aside from the historical perspective of the house itself, we learned about Robert F. Lee’s place in history, and Martha and George Washington’s family history from our visit. George Hadfield, who also worked on the design of the United States Capitol, designed the mansion. 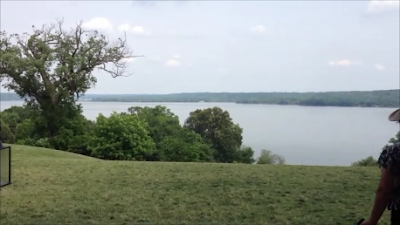 We saw some interesting things outside the mansion, like a replica of the L’Enfant’s Plan (plan developed in 1791 by Major Pierre Charles L’Enfant for George Washington, now the city of Washington DC) and a lone century old tree in front. As our tour wound down, we passed what seemed to be a redwood forest. Arlington House is a part of the National Park Systems (NPS). I drove south along Jefferson Davis Highway (H1) to Mt. Vernon, Virginia George Washington’s Mount Vernon Estate. Mt. Vernon was less than 15 miles from Arlington, but the GPS registered 32 minutes to get there. Passing typical towns in America with chain restaurants and stores, the road narrowed to a two-lane road and I found myself driving through beautiful countryside that it made driving enjoyable. George Washington’s Estate had a look and feel of a private estate. The ticket to enter the estate was pricier than most public parks or museums. There was a time schedule to visit the mansion printed on the ticket. Since we had time before our scheduled visit, we walked the narrow road winding upwards between century old trees (tulip poplar tree circa 1776) to see Martha and George Washington’s tombs. Then we wandered around the estate grounds. The estate did not have the feel of a European castle or mansion with manicured lawns, but looked very organic. It looked as if it was unchanged in centuries. In the small hills beyond, we saw horses and goats. On our way to the wharf, we passed a farm and farmhouse (shed) where a woman in 17th century garb was demonstrating wheat treading. The wharf looked big for private use. Now used for sightseeing cruises (none was being offered during our visit though), the wharf looked lively. We walked around the gardens. After exploring the estate grounds, we visited the mansion where a guide was stationed at each room to greet the visitors and explain about the specific part of the mansion. There were original objects found in the mansion, like the chair Washington used during his presidency. The main house had no bathrooms. We saw separate dwellings (outhouses) used for different purposes. For example, the laundry house, outhouse used as a stable and a separate house used for Washington’s carriages. The tour gave us a glimpse on the life of GeorgeWashington, the first president of our country. Not only was a statesman, George Washington was a farmer and a businessman. Mt. Vernon estate was modest compared to European statesman’s mansion or royalty estate. At the end of the mansion tour, we got to sit down and rest at the veranda overlooking the Potomac shore. The landscape was breathtaking. As I sat to absorb all that history and enjoy the landscape, it occurred to me that Washington was a remarkably rich man, who lived in a very rich land indeed. When visiting Washington DC, check out the Capitol visitor center. Visit your congressperson in the Longworth building across the street. The library of Congress and Supreme Court are behind the capitol. They used to let you see the court in session for a few minutes. "The rule in Washington is to have fun" - a quote by Samantha C, an 8-year old girl I met at the Hilton Executive Lounge. She's a very smart girl, a talented actress & script writer and an aspiring travel writer.